One of the seven natural wonders of the world, the Grand Canyon is known for its exceptional natural beauty and landscapes. Find some interesting and fun facts about this magnificent spectacle here. Known for its plunging gorges and incredible valleys, the Grand Canyon is one amongst the earth’s greatest on-going geological spectacles. Ideally situated in the Grand Canyon National Park, this spectacular and mesmerizing gorge is located in the state of Arizona in the United States. The mile-high, multicolored rock walls, craggy cliffs and sandy slopes are sufficient to captivate one in its natural grandeur. Undoubtedly, the Grand Canyon is embedded with powerful and inspiring landscapes to overwhelm one’s senses largely because of its immense size. Truly said, the Grand Canyon is an embodiment of nature’s awesome power and surpassing beauty. 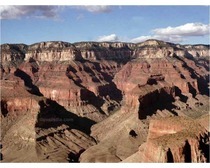 Check out some more interesting and fun facts about the majestic Grand Canyon. The Grand Canyon was declared a national monument in 1908. Eleven years later, in 1919, it was announced as the United States National Park. Furthermore, this park was declared a World Heritage Site in 1979. The earliest inhabitants of the Grand Canyon are known to be American-Indian tribes, such as the Hopi, Navajo, Havasupai, Paiute and Hualapai. 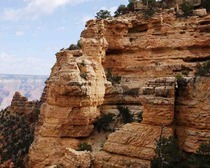 The most visited tourist attraction in Arizona and one of world’s most premier natural attractions, the Grand Canyon has two main routes: the South Rim and the North Rim. Spread across 1,218,376 acres of land, the Grand Canyon is 277 miles long and 18 miles wide. The gorges and valleys are 5000 feet, while the deepest point is 6000 feet. 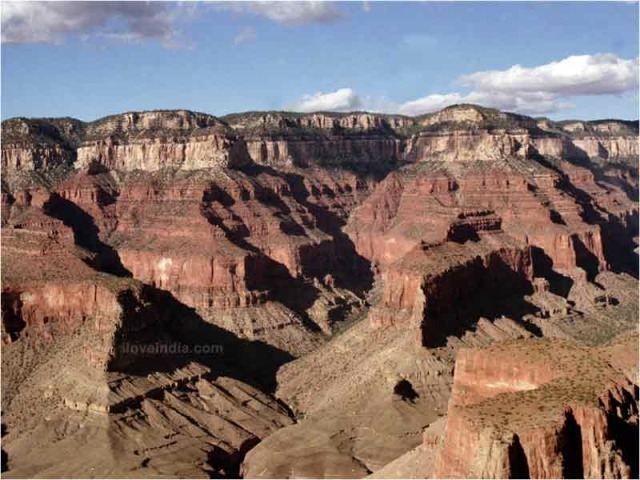 Point imperial is the highest point of Grand Canyon at 8000 feet located in the North Rim. Geologists believe that the deep ridges, cliffs, valleys and gorges in this magnificent natural beauty are the outcome of soil erosion that took place several million years ago. The major causes for soil erosion have been noted as river, ice, volcanic eruptions and wind. One of the largest rivers of the United States, the Colorado River has been a major contributor to the uneven topography that one notices at the Grand Canyon, such as huge towers, turrets, edges and crags, spread all across the area. The mountains and valleys rested here exude rocks in different colors giving the canyon a distinctive look all together. One can find gypsum, limestone and chert on the mountaintops at an elevation of about 1,000 feet. The Grand Canyon Skywalk, situated at 4,000 feet above the floor of the canyon is one of the most famous tourist attractions here. Considered to be one of the highest man-made structures in the world, the Grand Canyon Skywalk is a horseshoe-shaped glass walkway. The 70 feet glass-bottomed cantilever makes Grand Canyon Skywalk one of the most startling and breathtaking destinations in America and the most recognizable cantilever structure in the world. Did you know that the Grand Canyon is home to over 75 species of mammals, 50 species of reptiles, 25 species of fish and 300 species of birds? The most commonly found animals include mule deer, desert bighorn, bobcats, coyotes, rabbits, bats and squirrels. However, the bald eagle and willow flycatcher are two endangered bird species that are the most eye-catching in the park.